New wireless "WiFiber" tech faster than fiber? Virginia startup GigaBeam set their sights high with their new wireless system: they're taking on fiber. They dub the tech "WiFiber," and are positioning the product as a replacement for fiber optic pipes in situations when they're too expensive, too harmful to the environment, or just too slow to deploy, and they're claiming one gigabit per second speeds to sweeten the deal. 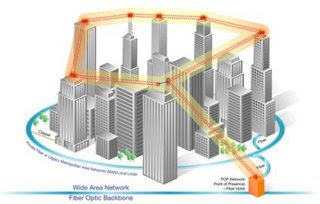 WiFiber operates in the 71-76, 81-86, and 92-95GHz frequencies to avoid interference and so that the signal is less impeded by light rain or fog than current high-speed wireless competitors. It also transmits in a tight beam to avoid overlap, but you still need a line of sight, so heavy rain can spoil your day. If conditions are right, though, GigaBeam's signal can make it for 10 miles, and is already shooting data from the Trump towers in NY and from a few other metro sites. Unfortunately, it's mainly for business links right now, since it's currently $30,000 for a set of radios (but that price should drop soon).